This dish is typical of what I can serve my meat-eating Significant Other when it comes to vegetarian or vegan meals without (much) grumbling… He knows, and agrees that a plant-based diet is better for our health, yet he says it almost always leaves him feeling unsatiated. So what’s the trick? I have come to the conclusion that I need to combine several colors, several textures, some healthy fat, and make sure there is something crunchy in the deal. So there you have it: quinoa, peas, beet (like so many other vegetables, tastes even better when oven roasted, have you tried parsnip or sweet potato « fake fries »? ), and slightly toasted pumpkin seeds for the crunch, with a drizzle of organic sesame oil at serving time. I often include beets in our diet, always bought raw and organic, and I still don’t understand why it is sometimes listed as potentially containing sulfites. It would be a shame not to eat any, given their numerous health benefits. In this recipe, as in all the recipes on this blog, there is no added anything, no preservatives of any kind. I hope you can try it and tell me what you think. 1. Peel the beet, cut up in chunks over a bowl. Toss and coat with a TBSP of olive oil, place on a baking sheet and bake for about 35 minutes. 2. Cook the peas in a large quantity of salted boiling water, 15 minutes. 3. Meanwhile, rinse the quinoa several times to remove bitterness. Using a slotted spoon, scoop the cooked peas out, saving the cooking liquid which is then used to cook the washed quinoa, ten to twelve minutes or until the germ pops out. Drain and mix together cooked peas and quinoa. 4. Toast the pumpkin seeds in a skillet over medium heat – no need for any oil. Watch them bloat and pop ! 5. 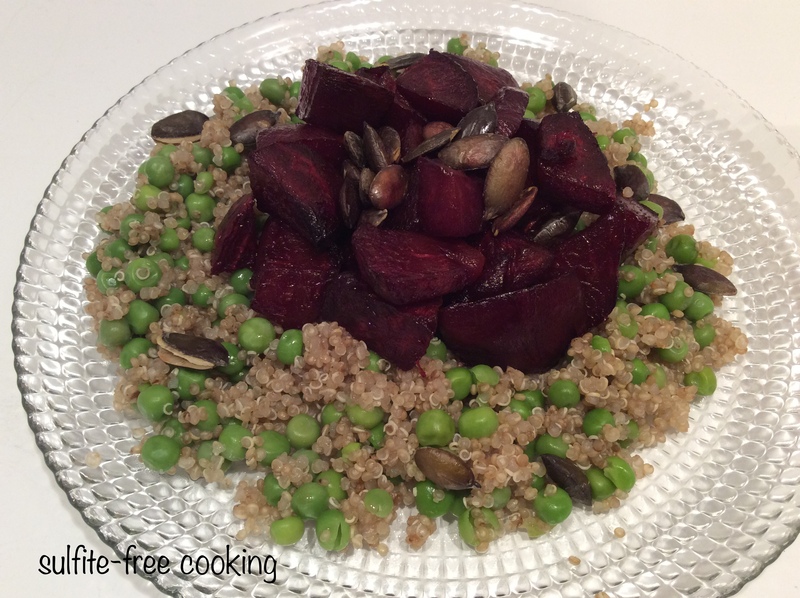 Place the quinoa-pea mix on the plates, spoon the beet chunks, then the toasted seeds on top. Salt to taste and drizzle with sesame oil. There is really nothing to this meal. If you do not like or do not tolerate beets, I suggest roasting carrots instead. And the lucky ones can also add some roasted sweet onion to the dish. mmmmm another yummy looking recipe! We also went through similar issues. It took me a whyto build up a repertoire to recipes.